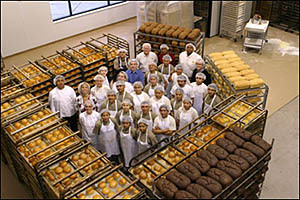 The Franklin Street Bakery encompasses both a wholesale commercial bakery and a retail operation. Along with providing the sinfully delicious pastries and breads to Tejas and Bar Abilene, our products are available to the finest restaurants, hotels and retail establishments through your food service distributor. Our bakery started as an in-house bakery , but moved to South Minneapolis in 1994 to accommodate the growing demand for its products. The first retail operation of the Franklin Street Bakery opened in October of 1998 in the Marketplace of Dayton’s (now Macy’s) flagship store in downtown Minneapolis. In the spring of 2001, our popular line of made-to-order personal gourmet pizzas were introduced and became an instant hit to an eager public.